Mister Chill’R and Planewalker once again team up to bring you a world-inspired, funked-out glitch-hop and psystep release with an exotic flavor! Following their third release Boom In Bloom, Chaos Control unleashes the Ganja Geisha upon the unsuspecting masses of festival-goers. 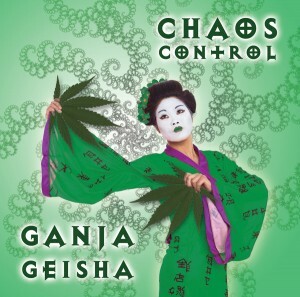 Starting off with Ganja Geisha, a bizarre blend of glitch-hop, reggae, and traditional Japanese geisha music, this track is sure to put your brain on vacation. Next up is Jawbone Juxtaposition, a super-strange and freakishly boingy track, featuring swingin’ metallic glitch-hop beats, brain-twisting bass lines, and jawharps galore! Marrakesh Mourning is a psystep track with a middle-eastern vibe. In this song, Mister Chill’R and Planewalker deliver their signature fusion of heavy, spaced-out backbeats, wobbling bass lines, and weird world acoustic instruments in a whole new way. In a similar vein, Planewalker and Mister Chill’R then unveil Arabian Analog, a harder-hitting venture into world-step with gigantic tribal drums, finger cymbals and a bazaar full of of bizarre instruments. If you like the sound of sacred bass, your ears will love this incredible fusion of whomp, weird, and world! MP3 Download | FLAC Download | WAV Download · Download count: 8,440. Great drums and bass!!! Realy nice. Beatifull album! thank you for making my day brighter! Very nice one!! 4/5 from me!